Well, it is finally official. 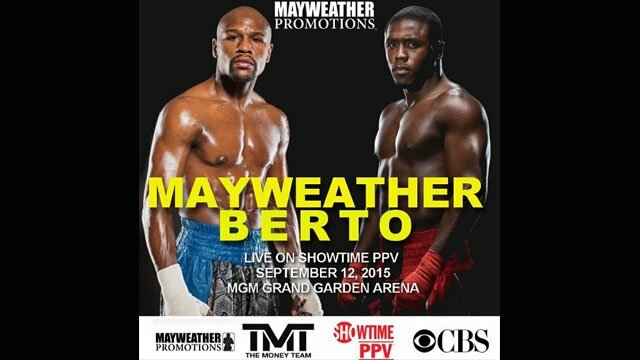 After yet another Floyd Mayweather saga of choosing an opponent, he has finally chosen Andre Berto. The contracts are signed and it is set for 8 PM ET on September 12th 2015, live at the MGM Grand in Las Vegas Nevada. The fight will be televised in showtime PPV with a price tag of $64.95 (standard), and $74.95 (HD). It will be an action packed night. Maywether (48-0, 26 KO’s) will be defending his WBAsuper & his WBC Welterweight titles against the hard hitting Berto (30-3, 22 KO’s). Also, Badou Jack (19-1-1, 12 KO’s) will be defending his WBC Super Middleweight title against George Groves (21-2, 15 KO’s) in the Co-Feature. Also on the undercard, Roman Martinez (29-2-2, 17 KO’s) will be defending his WBO Super Featherweight title, against former champion Orlando Salido (42-13-2, 29 KO’s). Mayweather is of course coming off of a unanimous decision victory over manny Pacquiao back on May 2nd. Andre Berto is also coming off of a win against Josestio Lopez (3/13/15), where he seemed to be losing the fight, and then dramatically knocked Lopez out in the 6th round of their fight. If Mayweather wins, he would tie the legendary Rocky Marcianos’ record of 49-0. The fight against Berto would compete the record breaking contract Mayweather signed with Showtime (6 fights/$300 million). There has however been speculation that Floyd will return for 1 more fight after, to get to 50 wins and become “TBE”. It will be an exciting night, with 3 different World Championship fights being brought to you by Showtime PPV.